There was a tweet late last week from John Rocha, one of the Top 10 Show hosts and film connoisseur, recommending the film starring Paul Newman as an alcoholic, down on his luck lawyer who was handed a huge case in The Verdict. I had heard Rocha and his co-host talk about The Verdict on another show and I was interested in seeing it so I searched it out. The Verdict is a wonderfully acted and taut story of a pregnant woman who had been given the incorrect anesthesia during a surgical procedure that led to her having brain damage and slipping forever into a coma. Lawyer Frank Galvin (Paul Newman) turned down an initial offer of $210,000 from the Church and the hospital in Boston where the two highly respected doctors involved were on staff. This was probably the one area where I had some problems with the film. It is known that a lawyer is duty-bound to present any settlement offers to his/her clients before rejecting it. In the movie, Frank rejects the offer without checking with the victim’s sister and the sister’s husband. In fact, the couple were very mad at turning down the money, since they could have used it. That was a major faux pas. Frank started the case for the money, but along the way, after he went and saw the victim, he gained perspective on life and the unfairness of the situation. Newman really played the character well, highlighting the desperation and guilt over the chance that he could lose the case. You can see the progression of the character from an angry drunk to someone who is ready to fight. The Verdict seems to also have something to say about the way the court process works, as the judge, defense attorney and even Frank himself are shown doing things that benefit themselves that even border on malpractice. The Judge (Milo O’Shea) is a reprehensible figure who tanks a round of questioning by Frank because he wanted to break until the afternoon and lunch was waiting for him. Justice was far from his mind. Then the defense attorney, a big time lawyer named Ed Concannon (James Mason), had his own dirty dealings in the case. Charlotte Rampling, who played Laura, a woman Frank met and became intimate with but who had her own reasons, felt superfluous to the story and did not drive enough o the story to warrant her inclusion. She did fine in what she did, but it just felt unnecessary. The Verdict was a fascinating movie filled with flawed people and a jury system that has its bugs as well. Newman is outstanding and the whole cast does great work. 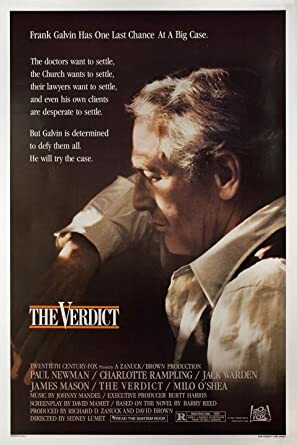 The Verdict was a five-time Oscar nominated film, including for Best Picture, Best Actor (Newman) and Best Supporting Actor (Mason). Great review! I don’t think I’ve heard of this one before! Sounds like it’s pretty good. I don’t know why, but I really like the poster. It was really good. I recommend it.